Global Hotel Alliance (GHA) is a collection of brands that use Discovery program to drive business to their properties (while often having separate loyalty programs). GHA is for a long time offered Platinum or Black status for certain credit card holders and this practice continues. Members that have Asia-Pacific issued World Elite Mastercard can now have Discovery Black status through December 2020. You can access this offer on GHA’s website here. Many of these chains have their own loyalty programs with points and free nights that are run concurrently with GHA’s Discovery which is a guest recognition one. You have to keep in mind that Hyatt recently purchased Two Roads Hospitality that owns the Alila brand. This will surely move from GHA to World of Hyatt in due course. If you have Asia-Pacific issued World Elite Mastercard, it makes sense to sign up for this now because the status is valid through the end of next year, and you never know when you may find yourself in one of these participating hotels. Not sure how much sense there is to participate into a program like GHA’s Discovery where you don’t earn free nights? You merely earn “local experiences”. The DISCOVERY Black status offer is valid only for World Elite Mastercard cardholders in Asia Pacific. E.g. If you enrol on 1 October 2018, you will be able to earn room nights until 1 October 2019 to maintain your status as opposed to having to earn status by 31 December 2018. After the initial 12 month period, point calculations are based on the calendar year of January – December. For the avoidance of doubt Ineligible Rates shall include, without limitation: (1) Wholesaler rates; (2) OTA/Third party websites bookings (regardless of rate paid); and “opaque” bookings where the brand may or may not be known at the time of reservation; (3) tours series rates and charter rates (4) room rates for airline staff and crew where rooms are pre-booked and paid for by the airline or directly; (5) travel-industry staff rates; (6) any employee rates, employee family or employee friends discount rates; (7) other discounted rates; (8) any complimentary, free, traded or bartered night stays, or any stays in connection with gift certificates or other awards or vouchers. Black level membership is valid for 12 or more months. World Elite Mastercard Cardholders are required to stay at least 30 Qualifying Nights at any DISCOVERY hotel within the first 12 months of their enrolling date OR 30 Qualified Nights in a calendar year (January – December) to renew their Black level membership. 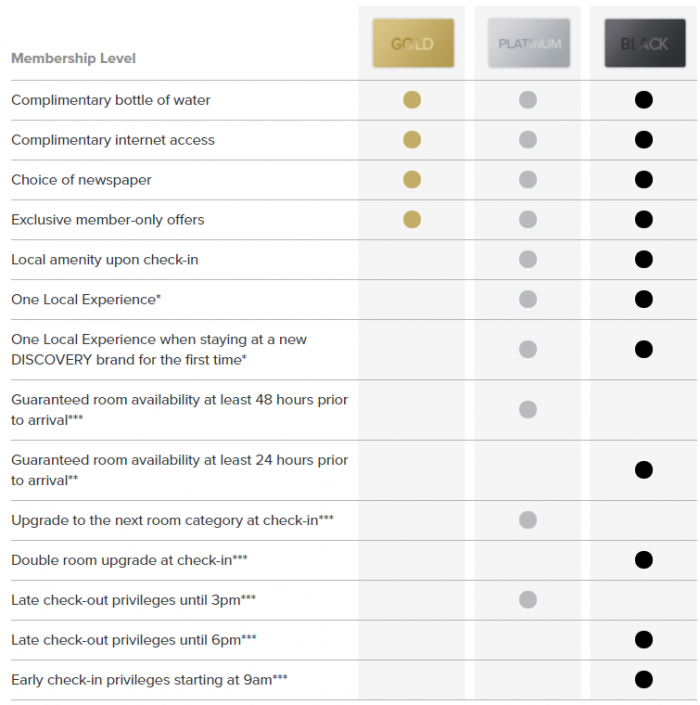 Should the Cardholder not fulfill the minimum night requirement within that period or the calendar year, his/her membership to DISCOVERY programme will be downgraded to Platinum level.